This chapter contains examples of common dental anomalies, as encountered in pediatric dental practice, which were not treated in Chap. 6. The radiographic images taken with different radiographic techniques and their radiographic differential diagnoses are presented. The aim of this chapter is to familiarize the reader with the different results of the techniques explained in the previous chapters. Obviously not all types of anomalies were captured in this textbook chapter, but at least the reader will get a better feel about how the images turn out and what information can be retrieved from them. 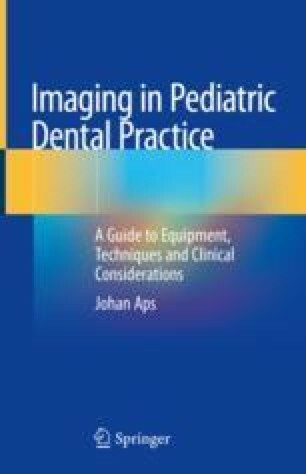 Alhilou A, Beddis HP, Mighell AJ, Durey K. Dentin dysplasia: diagnostic challenges. BMJ Case Rep. 2018; https://doi.org/10.1136/bcr-2017-223942. Andersson K, Malmgren B, Astrom E, Dahllof G. Dentinogenesis imperfecta type II in Swedish children and adolescents. Orphanet J Rare Dis. 2018;13(145) https://doi.org/10.1186/s13023-018-0887-2.